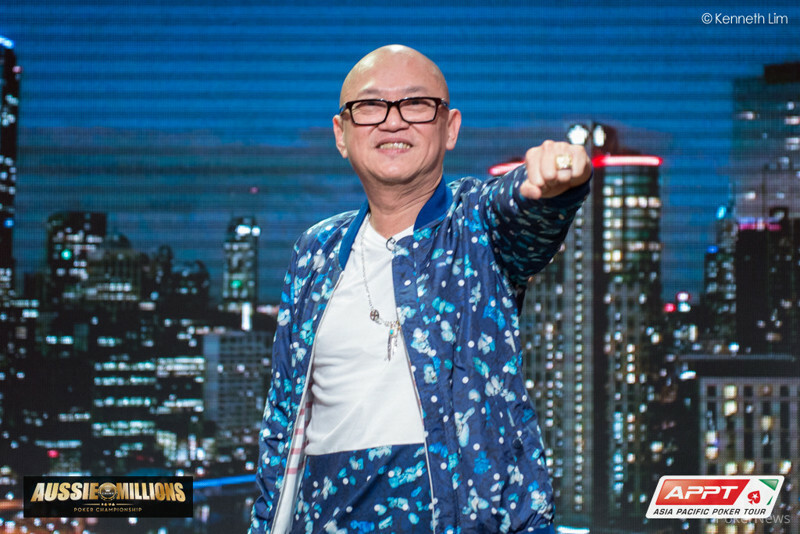 Richard Yong Wins the Aussie Millions $100,000 Challenge (AU$1,870,000)! "Where's the party at?" shouted Phil Ivey from the rail, looking on after his friend Richard Yong was busy basking in the bright lights after his big win. That's certainly a question worth asking, as Yong has topped the field of 70 entries in the 2015 Aussie Millions $100,000 Challenge to win a massive AU$1.87 million. After a few days off, the final eight players returned to the Exhibition Hall at Crown Melbourne to play down to a winner. 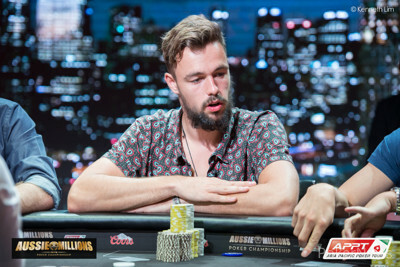 The tournament recommenced with German wunderkind Ole Schemion as chip leader, and it was a spectacular day of high-stakes poker from start to finish. Not surprisingly, the first elimination of the day was the short stack. 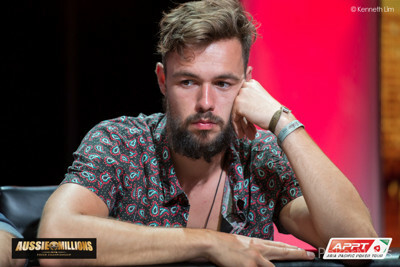 Alex Trevallion was having a stellar Aussie Millions that included winning the AU$25,000 Challenge and finishing 33rd in the Main Event. In what would be his final hand, Trevallion shoved his short stack all in from middle position with the and received a call from Yong, who was in the big blind with the . The board ran out a clean , and Trevallion had to settle for eighth place and AU$310,000. That brought his 2015 Aussie Millions winnings up to just shy of AU$1 million. Dani Stern was the next to go when he got his short stack all in holding the and was up against the of Yong. 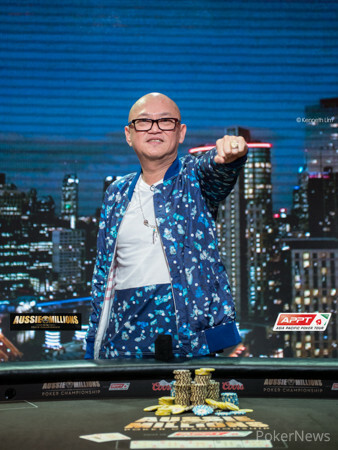 The board ran out , and Yong's rivered pair scored him his second final table knockout. From there, Erik Seidel lost a big pot to Scott Seiver in Level 19 (20,000/40,000/5,000) and was finished off by Schemion one hand later. One hand after that, Schemion shoved all in from the small blind to put the pressure on Jason Mo, who was in the big blind with a shorter stack. Mo called off with the and was ahead of Schemion's , but he got straightened out after the board came down . Then, Justin Bonomo raised the button only to have Seiver three-bet all in from the big blind. Bonomo called off his shorter stack with the and was looking to double against the of Seiver. That didn't happen, though, as the board ran out to give Seiver a full house. Seiver would then fall in third place after he ran his into the of Yong. With that, the heads-up match was set with Yong holding 4.915 million in chips to Schemion's 2.085 million. Despite boasting a tournament record that has nearly $4.5 million in earnings, Yong has never won a live event. On the other hand, Schemion has won 11 of the 52 tournaments he's cashed in, for a rate of 21.15 percent. Furthermore, when Schemion has reached heads-up play, he has an impressive record of 11 wins and five losses, winning the event over two-thirds of the time. This would be one of those times Schemion didn't win. The two battled back and forth in spectacular fashion, with five double up occurring between the two. Then, deep into Level 23 with the blinds at 50,000/100,000 and no antes due to heads-up play, the final hand took place. Yong limped in from the button, and Schemion checked his option from the big blind before the dealer ran out the flop. After Schemion checked, Yong bet 150,000. Schemion check-raised all in for around 1.5 million, and Yong snapped it off. Schemion tabled the for an up-and-down straight draw, and Yong had the . The turn was the , and the river was the . That gave Yong the title and eliminated Schemion in second place for AU$1.35 million. After the win, Yong was joined on stage by Ivey, Sam Trickett, Winfred Yu, and others. This win marked the first live tournament victory for Yong, and his largest score ever. He's had some big results in the past, but surely nothing as important as this victory in Australia. Congratulations to him and all the other winners from this event. As for the Aussie Millions itself, things aren't over just yet. Tomorrow marks the final table of the Main Event and the kickoff of the big, bad $250,000 Challenge. You can follow the coverage live on PokerNews starting at 12:15 p.m. local time, so be sure to tune in. Until then, you can find us at the bar! Richard Yong limped in from the button, and Ole Schemion checked his option from the big blind before the dealer ran out the flop. After Schemion checked, Yong bet 150,000. Schemion check-raised all in for around 1.5 million, and Yong snapped it off. Schemion tabled the for an up-and-down straight draw, and Yong had the . The turn was the , and the river was the to win Yong the tournament and eliminate Schemion in second place. For the result, Schemion took home AU$1.35 million, but it was Yong walking away with the title for AU$1.87 million. A very funny pot just played out that saw Richard Yong bluff and show Ole Schemion. Schemion raised to 200,000 off the button and Yong peeled to see a flop appear. Schemion continued for 200,000 and called when check-raised to 600,000. The turn was the and Yong set Schemion all in for his remaining 1,770,000. Schemion had to use his time breaker chip as his 30-second allotted thinking time almost ran out. To help him, Yong threw his last one over with a big smile across his face. Schemion wasn't allowed to use it and his time ran out. Yong opened and raked in the pot. On the flop, Ole Schemion checked, and Richard Yong bet 100,000. Schemion check-raised to 330,000, and Yong called to see the pair the board on the turn. Schemion bet 325,000, and Yong folded. Ole Schemion was all in from the button for 940,000, and Richard Yong called from the big blind with the . Schemion had the for the best hand. The flop, turn, and river ran out , and Schemion doubled up to 1.88 million. Yong still held the lead with 5.12 million. A cooler of a flop where both players flopped trips has seen the chip lead change again. The board ran out to send the chips to Yong. Game on again after Richard Yong luckily doubled through Schemion. Yong limped in and called all in after Schemion shoved on him. The board ran to make the Malaysian a straight! On the button, Ole Schemion raised to 200,000, and Richard Yong called from the big blind. The flop came down , and Yong checked. Schemion bet 225,000, Yong check-raised all in, and Schemion quickly made the call. The cards were on their backs with Schemion holding the for top pair against Yong's for a flush draw. The turn and river kept Schemion in front, and he doubled into the chip lead. Schemion was all in on the flop for 2.65 million. Ole Schemion has gotten his stack back up to 2.65 million after he forced Richard Yong off his hand. Schemion check-called flop and turn before he jammed all in on the river of a board. Yong looked understandably disappointed as he let his hand go. Who Will Win the Aussie Millions $100,000 Challenge? Vote Now! Are You Ready for a Stacked Final Table in the $100,000 Challenge?